WE ARE FEATURING A DELIGHTFUL & COLORFUL E. VINCENT DRAGON - SIAB ARTIST SIGNED MYSTIC FANTASY COLLECTOR SERIES FIGURINE. OUR NEW, UNSOLD AND VERY DETAILED DRAGON'S HEART / DRAGON KISS STATUE IS IN MINT CONDITION AND COMES WELL PROTECTED IN ITS ORIGINAL GIFT BOX. IT HAS THE E. VINCENT DRAGON SERIES TINY DRAGONFLY COMPANION SEEN ON EVERY ORIGINAL PIECE RESTING AT THE FEET OF OUR KISSING LOVERS. 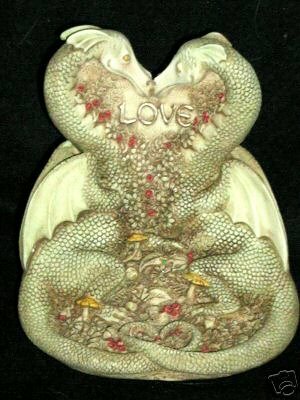 OUR DETAILED AND COLORFUL MAGIC FANTASY ART STATUETTE FEATURES ONE CAPTIVATED PAIR OF DRAGON'S COILED TOGETHER FORMING TWO MYSTIC AND MAGICAL LOVER'S HEARTS, WITH A GOLD GILT "LOVE" WRITTEN ON THE FRONT AND A RED HEART FEATURED ON THE REAR, BORDERED BETWEEN AND BELOW BY FLOWERS, MUSHROOMS AND FLORA! OUR 1998 COLLECTABLE DRAGON'S KEEP ART AND GIFT STATUE IS CRAFTED FROM ART QUALITY POLYRESIN, DATED AND SIGNED BY THE ORIGINAL ARTIST ON ITS BASE. IT'S ABOUT 4" TALL AND RESTS ON A 3 3/4" BASE. If you have any questions about this product by THE E. VINCENT DRAGON FANTASY ART COLLECTION, contact us by completing and submitting the form below. If you are looking for a specif part number, please include it with your message.